The old-fashioned is a fantastic cocktail and—because it's so simple—it offers a number of opportunities to play with the ingredients. In the old-fashioned 101 recipe, Wild Turkey Bourbon adds a wonderful blend of flavors to tantalize your taste buds. For this twist on the old-fashioned, the bourbon is accented with apple cider, fresh sage, and brown sugar. The saffron and orange peels give the drink a spicy tang, which is perfect against the robust notes of Wild Turkey 101. All of this results in an old-fashioned as you have never known it. Slice the cherry from top to bottom five times around the pit. Soak in a few ounces of amaretto for 30 minutes to 1 hour. Muddle the apple cider, sage, saffron, brown sugar, orange twists, and orange zest together in a mixing glass. Add the bourbon, fill the glass with ice, and stir well. Strain and serve over fresh ice in an old-fashioned glass. Garnish with the amaretto-soaked cherry. You'll want to muddle this cocktail very well to incorporate all the herb, spice, and citrus flavors into the sugar and cider mix. Press and turn the ingredients for a good 30 seconds. Don't worry about appearances because you'll strain everything out of the drink anyway. Saffron will stain a wood muddler a yellowish color. For that reason, you might want to use a stainless steel or rubber-tipped muddler for this drink. Be sure to stir this drink for a full 30 seconds. The agitation of the ice will add a perfect amount of dilution to marry all the flavors together. Any brand of amaretto will do just fine for soaking the cherry garnish, even though the recipe recommends Amaretto Di Saronno. It's also very easy to make an entire batch of amaretto-infused cherries. This is a good way to preserve fresh cherries when they're in season during the spring. 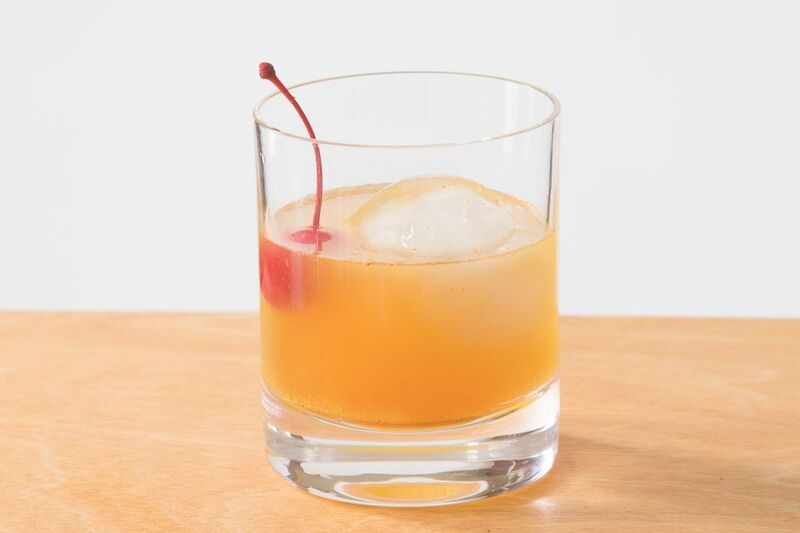 Simply follow the steps for homemade maraschino cherries and switch the liqueur to amaretto. True saffron is a very expensive spice and it's not a staple in most pantries. You can either skip the red spice—sold whole as strings or powdered—or use a small pinch of turmeric instead. Turmeric is a saffron substitute used for the similar yellow color it produces. It doesn't have a big effect in this drink because of the bourbon and cider, but it does help. Wild Turkey 101 is the recommended bourbon and it stands up to the myriad of flavors in this cocktail. Of course, you can use any bourbon you like, though lighter whiskies may get lost in the mix. You'll likely find it best to stick with a full-flavor, robust substitute that's also higher than 80 proof. Old-fashioneds are served as short drinks that are typically less than 3 ounces because they are on the stronger side. After all, you're essentially adding flavor to a shot of whiskey. This recipe adds a little apple cider, but it also uses a 101-proof bourbon, so the two elements even out the final alcohol content. On average, this drink weighs in around 27 percent ABV (54 proof), which is right in line with other old-fashioned variations.